Even in their native Mediterranean countries, fallow deer are rare for “wild” animals. Most herds are semi-domesticated. 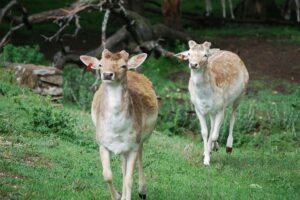 Fallow deer are the most widely kept of the world’s deer and have been introduced to all inhabited continents. Coloration is highly diverse, as up to 14 variations occur from white through shades of red brown to dark brown, with some adults retaining their original spotted markings. Whatever color they are born will be the color they retain for life. 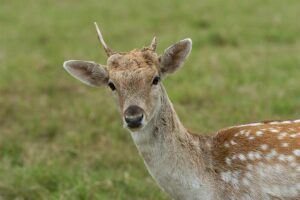 The rump of the fallow deer is white; when alarmed, the hairs on the rump stand erect and the tail is held high, revealing a flash, which warns other deer of the threat. Their main defenses are running away and hiding, although hooves, antlers and teeth are used as a last resort. 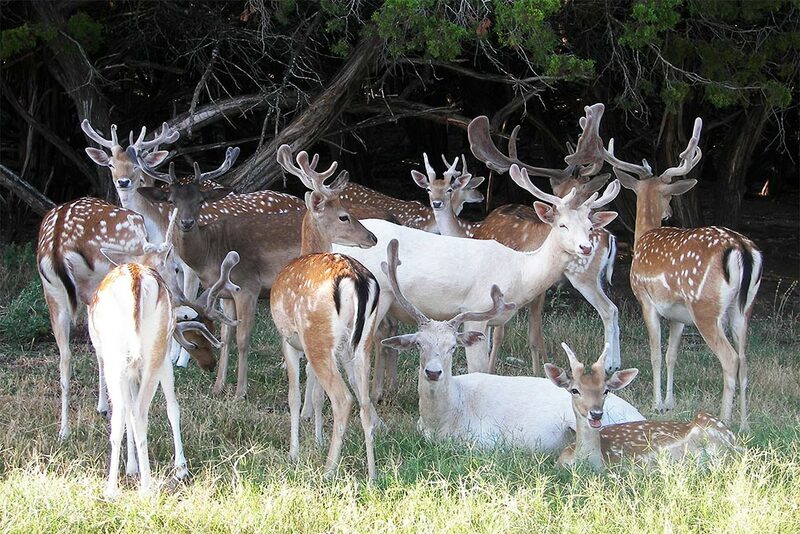 When threatened, the frightened fallows flee into the woods, using their varied coat colors effectively as camouflage. In October, the bucks gather the does into harems. There is a certain amount of fighting, but this is mostly for show. 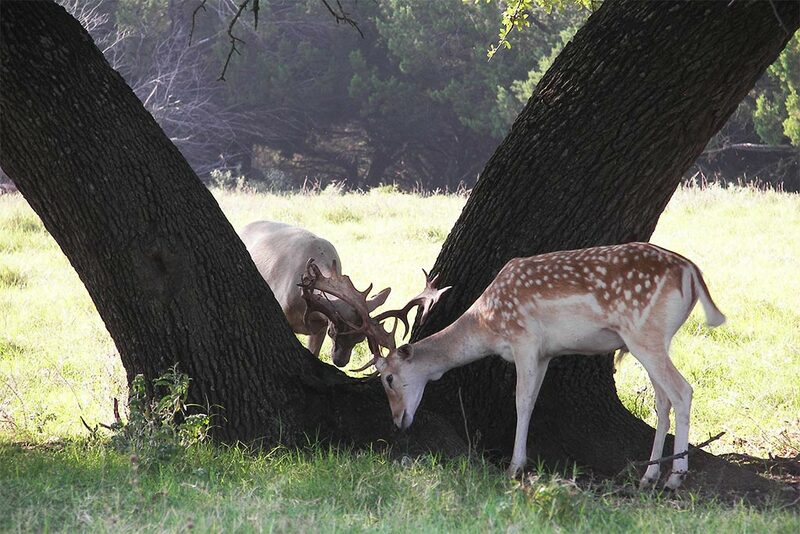 Bucks do not eat during the rutting season from September to mid-October. They mark off and defend a small area known as a “stand” from which other rutting males are excluded. Does and young remain within the male territories, and as each doe comes into heat, she is followed until mating is accomplished. After the rut, males generally cease defending their territories and form bachelor herds, while females and young remain segregated from males and in their own groups. The bucks shed their antlers and grow a new rack in time for the next rut. The number of points on their antlers increases with age. Fawns weigh approximately 10 pounds at birth. During the first few days of life, the fawn is concealed in bracken or other suitable undergrowth with its only protection being the camouflage coloring of its coat and the absence of any scent to betray it to predators. Fallow deer do much of their feeding in open, grassy areas but require tree cover and undergrowth for shelter. 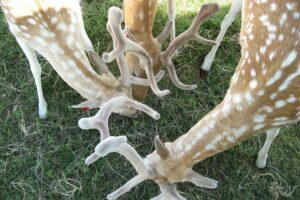 Food availability appears to determine whether fallow deer in an area are predominantly grazers or browsers.